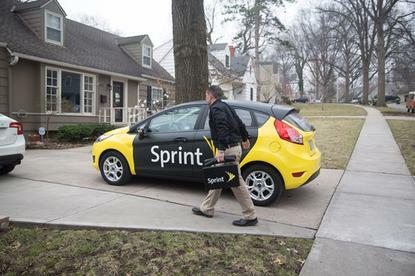 Faced with a highly competitive market, U.S. wireless operator Sprint is now offering to deliver and set up phones, tablets and other connected devices for free at homes, offices and other locations chosen by the customer. The offer is currently limited to eligible upgrade customers, but starting September, new customers in selected markets will be able to choose the new Direct 2 You option, when buying online or through call centers. Launching in Kansas City metropolitan area on Monday, the program will be expanded across the country using about 5,000 branded cars and employing 5,000 staff by year end. A rollout in Miami and Chicago is scheduled for April 20. Deliveries will however be confined to specific zones in the cities. The bid by the carrier to bring "in-store experience" to homes and offices includes besides delivery of the phone, the set up the device by a Sprint-trained expert. The representative will transfer content from the earlier phone, and provide a tutorial and offer tips on the use of the new device. The operator's representative will use the visit to also give a quote for the existing phone under the Sprint Buyback offer. Sprint said it developed the service based on customer research and insights that indicated "the need for a revolutionary service like this one." Customers will be alerted to the offer to upgrade their phone by text or email. The move by Sprint comes even as the company planned to set up 1,435 co-branded stores at RadioShack outlets over the weekend. The company said its aim is to help consumers get phones in the most convenient way. "If it's a personalized delivery -- we can do that now. If it's about a great in-store service, we can provide that as well," according to a company FAQ. A Delaware bankruptcy judge approved a plan earlier this month to sell about 1,700 stores of the electronics retailer to hedge fund Standard General.